Its not often one gets to brag about owning the only gadget in a whole country - but as the XO Tablet is only available from the USA, and the Australia arm of OLPC aren't touching it, right now this is the case. Thanks to the generosity of fellow EdTech experimenters Wayan Vota and John Hunt, my 6 year old daughter has now logged about 10 hours on this latest iteration of what a 'green machine' can be and I'm ready to report some first impressions. I'll get to her thoughts shortly - but first, given the at times highly charged nature of all-things OLPC, some context. 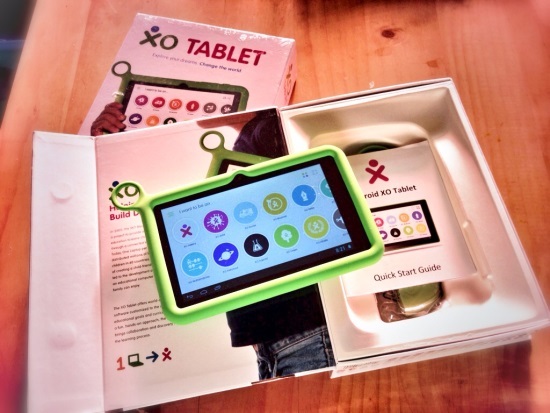 I have written for OLPC News before, am the Dad of a child in the target audience for the XO Tablet, and am a long-time OLPC supporter (with nearly 4 years of being employed by a state education department to support XO deployments). I'm also a well-known exponent of that other transformative mobile platform, the iPad, of which I've owned every model and even co-founded the Slide2learn.net community to support. I've also owned a Nexus7 Android tablet since its launch. What I'm trying to say is that I couldn't have been more excited to get an XO tablet that sits right at the convergence of all these interests. So, first impressions: I love the green case. Its chunky and grip-able and the ring is genuinely useful. Plus, buying such a case separately would immediately add another $20 to the price, so again this puts the XO Tablet ahead. The size and weight also are good for the target audience where I've found larger 10 inch tablets to be un-ergonomic for smaller hands to hold for longer periods. As Wayan has already noted, the next thing you come to with the XO Tablet is really the software. 200 apps is a good starting collection, as is the 'I dream' interface for curating the experience of browsing them. I have no idea how someone creates such a customised 'master' of a mobile OS and is able to mass-deploy it, but I wish such a process was available easily for any school or district rather than having to make do with more local configuration options. I have been disappointed with some of the apps however. The very first dream my daughter chose was 'Doctor' - but when we opened the first app to measure her pulse via the camera - nothing worked... There are also some apps I've come across that are in fact just trial versions. It can also seem like a bit of a waste when you open an 'I dream' category to find there are only perhaps 3 apps listed. I had in fact expected that when choosing an occupation to explore there would be videos, websites and other guided resources. So, though it provides a good framework for guiding students use of the included apps, OLPC has a lot of room to expand on and really flesh out the 'I dream' categories. I'd especially love if there was a way for parents/teachers to add additional categories or even resources into the existing ones. I'd put my hand up to help. So what else did miss 6 find? Turns out her favourite section so far has been the language videos. She's spent ages learning Italian by repeating the phrases in that video (which our 2 year old also happily sat in for). She has also enjoyed the solar system app that lets you zoom in and out on the planets and associated info ('I want to be an astronaut') and the puzzles challenges of the Blockish app. Other major pluses of the XO Tablet in my opinion are the account settings that let the tablet be used by multiple kids, and long term expansion made possible by the SD card slot. I'm also looking forward to exploring the usage data that the tablet is recording as miss 6 uses it to help me as a parent understand her learning interests better. So at the end of the day, for US$149, my first impressions are that the XO Tablet looks to be a great learning tool - not iPad mini class, but then its less than half the price. How reliable it proves over time, and how useful the promised port of Sugar ends up being we'll have to wait and see - but in its current iteration, with a good case and good range of starter apps, its got to be the best low-cost tablet option currently available for younger 1st and spanish-world learners that I know of. Jonathan Nalder is a long time OLPC supporter who is also an mLearning project officer, teacher, Apple Distinguished Educator and HP Catalyst Fellow. He writes regularly at uLearning.edublogs.org, has articles at Appolearning.com and Appitic.com, co-founded Slide2learn.net, has a Masters in ICT for Learning, and delights to make the connections between tech, pedagogy, planning and learning. Thank you for the useful insight to OLPC's progress, and struggles with the equipment. 1. Perhaps being from the U.S. and other developed countries we critics would like the OLPC laptops or table PCs to be loaded with everything, including flushing our toilets. 2. The target markets of undeveloped school children are probably not interested in all the bells and whistles. They just need some basic math, science, and some humanities apps suitable for their grade levels. 3. A few educational apps are needed, but they are well-written software. Plus the machine part has 10+ hours of battery, and good basic elementary school lessons. Je suis bien d'accord avec vous. Je travaille depuis 4 ans dans un petit village au Mexique (Lo de Marcos) dans une école primaire. Les XO-1 sont suffisants. Les enfants ont en fait besoin de peu. N'ayant pas d'encyclopédies, les recherches sur Internet sur Wikipedia espagnol sont, selon moi, suffisantes. À ça, un peu de traitement de texte pour apprendre à taper au clavier rapidement. Pour les enfants, c'est merveilleux. L'achat des deux tablettes XOTablet était dans le but d'en valider le fonctionnement en classe. Étant peu convaincu de l'utilité d'une tablette dans un tel milieu, je voulais tout de même valider mon impression. C'est dommage, car je ne pourrai pas le faire. J'ai un iPad, mais je ne veux pas l'utiliser avec eux. Trop dispendieux et trop fragile. J'aimerais bien savoir ce que les gens font avec leur XOTablet dans des pays en développement. I just bought 2 shelves XO. Both tablets are not working. One does not start and the other touch screen does not work. It is discouraging, is not it? I can not imagine the reaction of children in Peru or other countries. It must be very sad! I can not find any solutions. That's called "Death on arrivals". They happen. That's why there's always some additional hardware in the container that comes with the original order to the whole-sale level. You'll get 2 new ones. Apart from that: these tablets are not "made to be repaired", the XO laptops are. See why I prefer the laptops? And remember, OLPC has a tantrum: buy in group - unite in a cooperative and buy in large numbers. At least the OLPC laptops are made to be repaired. I don't trust other suppliers anymore. I have the impression they all have build in "made to fail" components and tricks. Anno 2014, with all the communication / internet etc., is it really that hard to bring the numbers of people together who can jointly order one 21 foot container with 3000 XO laptops? I mean, compare that to the organisational skill it took the OLPC to make the XO laptop. You just have to order it. Je viens d'acheter 2 tablettes XO. Les deux tablettes ne fonctionnent pas. L'une ne démarre pas et l'autre l'écran tactile ne fonctionne pas. Je les avais acheté pour des enfants de Lo de Marcos, Mexique. J'imagine mal la réaction des enfants au Pérou ou dans un autre pays. Ça doit être bien triste! À quelle adresse envoyer mes deux XOTablet qui ne fonctionnent pas? At what address to send my both XOTablet which do not work? You just follow the same route upstream how you got the 2XO Tablets? How did you get them? Bring them back to the shop or mail them back? It is an obligation in the EU that electronic stuff that fails within 2 yrs has to be repaired/replaced. -1 why XO Tablet children play OK but when him stop 20 minute but when him start play can't switch on? -2 why XO Tablet show Unfortunately the process com.google.process.gapps has stopped. -3 why XO Tablet Unfortunately, Android keyboard (AOSP) has stopped on Android. I bought 2 "Tablets OLPC." I had to return because the two did not work. One would not start and the other the touch screen was not working. So I bought 2 tablets "Digital 2" that work very well for writing texts, reading and consultation of Wikipedia on the Internet. There is even the camera for taking pictures. J'avais acheté 2 "Tablettes OLPC". J'ai dû les retourner, car les deux ne fonctionnaient pas. L'une ne démarrait pas et l'autre l'écran tactile ne fonctionnait pas. J'ai donc acheté 2 tablettes "Digital 2" qui fonctionnent très bien pour l'écriture de textes, la lecture et la consultation de Wikipedia sur Internet. Il y a même la caméra pour la prise de photos. Guy Bergeron, Lo de Marcos (Nayarit), Mexico.